I love blondies – I mean who doesn’t right? They’re basically chocolate chip cookie batter with all sorts of fun add ins. Here’s the thing though sometimes they just make my teeth hurt from their over the topness. I think it’s old age, but I now like my sweets a little less sweet and after trying to find a recipe that sounded right and failing this is what I came up with. 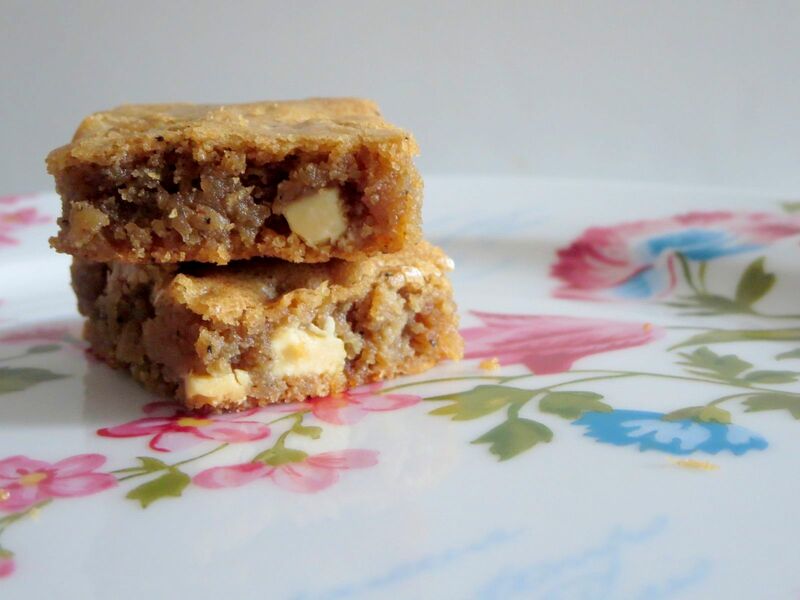 These are rich with the caramelly undertones of browned bitter, just sweet enough and chewy from the combination of sugars, nuanced thanks to the ground coffee interspersed throughout and have white chocolate chunks mixed in to to provide a perfect counterpoint to the more ‘adult’ flavours of this sophisticated take on a blondie. The ground coffee sounds odd, but finely ground coffee for a drip coffee maker works like a charm. You can dial it down a little if it makes you nervous, but my coffee loving self wouldn’t want to add more. Just be sure to watch the clock carefully on this one – it bakes pretty quickly. Preheat the oven to 350, grease a square 8*8 pan and set aside. Brown the butter in a saucepan – you can see how over here. Sieve the rich nutty liquid into a bowl and set aside. Whisk the flour, baking powder and salt together, set aside. Add the sugars and ground coffee to the butter mix and whisk well. Mix in the egg and the vanilla. Then stir in the flour mix until just combined. Fold in the white chocolate chunks. Bake for 20-25 minutes. Please start checking close to 20 and keep a close eye on it, pull the blondies out of the oven as soon as a toothpick inserted in the middle comes out clean. Cool, cut and enjoy. Eid Decor – An Eid Dessert Table! Oh my gosh, those look amazing! I’m drooling just looking and reading the recipe! Pinned it! Blondes are best. LOL. Only a blonde would say that. 😉 Also love the blondies! hahah Brunettes aren’t allll that bad 😉 The blondies we can definitely agree on! 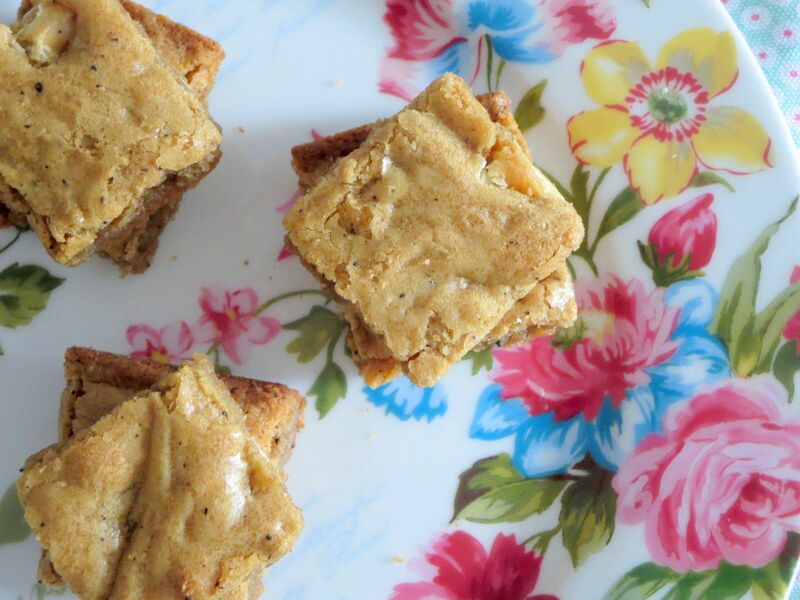 Oh my blondies look super moist and delicious….love the combo in here …..amazing Sarah. .. I do not have much of a sweettooth, but the look and sound of these makes my mouth water!! yum! *sigh* afra why can’t I be more like you!?!? I’ve never made a blondie before! Crazy right? These look amazing! Love the big chunks of white chocolate. Fabulous idea to use browned butter. It always adds such a nutty flavor to any dessert. Great blondies. Thanks Teresa – Between you and me I find browning butter to be easier than creaming butter so the lazy in me loves it even more! The browned butter and coffee are such wonderful ideas! I bet they’d be great with dark chocolate chips, too.